Spring is a time for cleaning and renewal. Spring is a time for cleaning and renewal. We do it with our house, our wardrobe and even our foods. Our bodies are inundated with so much noise on a daily basis, it makes sense to take a moment and pare our food down to the basics. This means finding foods that are good quality, fresh, in season and most importantly fun to eat. Utilizing this approach to cooking and your diet is a matter of beginning each dish with a great idea and fresh ingredients. For example, begin with a Florida tomato. They are packed with essential vitamins and nutrients that help nourish your body, can be used in a variety of ways and they can be enjoyed as is or partnered with a few key items. Serve up flavorful dishes that are rustic, like capellini alla puttanesca on the lighter side like a chopped salad, or just wash and bite. Tomatoes enjoyed in the simplest form, using just a few ingredients to highlight their flavor will give you meals that are clean, healthy, and will put a spring in your step. 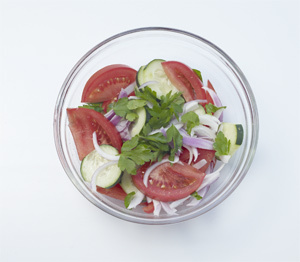 Visit floridatomatoes.org for more recipes and information.